(1960)aka WILD FOR KICKS. Gillian Hills, Christopher Lee, Oliver Reed, Noelle Adam, Nigel Green. Probably the best Brititsh JD movie ever madel So sleazy it's irresistible. 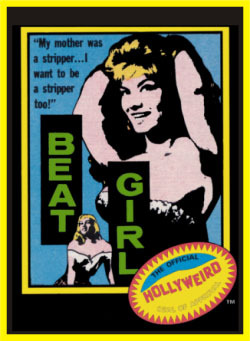 Hills plays a gorgeous but rebellious teenage girl who has beatnik friends, goes to wild parties, and does strip tease for the local youth. Great slice of the 60's scene in England. Crhis plays a sleazy nightclub owner who knows a good body when he sees one. 16mm. Upgraded 11-95.